Are dances made for artists or audiences? There is a delicate balance between art for art’s sake and pure entertainment. On the one hand, we need audiences in order to fund and validate dance. On the other, pandering to the public does nothing to advance and evolve the artform. Khecari, lead by Jonathan Meyer and Julia Rae Antonick, somehow manages to find that balance every time. As a metaphor, if Meyer’s latest work The Cronus Land was a David Lynch film, it would be more Twin Peaks than Inland Empire. In other words, The Cronus Land, running through Nov. 13th at the Shoreland Ballroom, is uncompromising in abstraction and artistry, but it’s not totally inaccessible. As with Meyer’s previous work Oubliette, each audience is restricted to 12 members, and per usual, hospitality is the name of Khecari’s game. Meyer greets us by name, offers a variety of cocktails, and tells us exactly what to expect upon entering The Cronus Land. After introductions, the audience enters the space through a parchment-like crispy shroud and is escorted to a viewing platform by a docent (Sara Nelson). The view from the platform is astonishing; within the cavernous space lay the remains of the once-glorious Shoreland Ballroom fallen into ruin. In the center, an enormous yurt-like structure surrounds Joe St. Charles and Timothy Young as they create a beautiful cacophony of sounds and music. 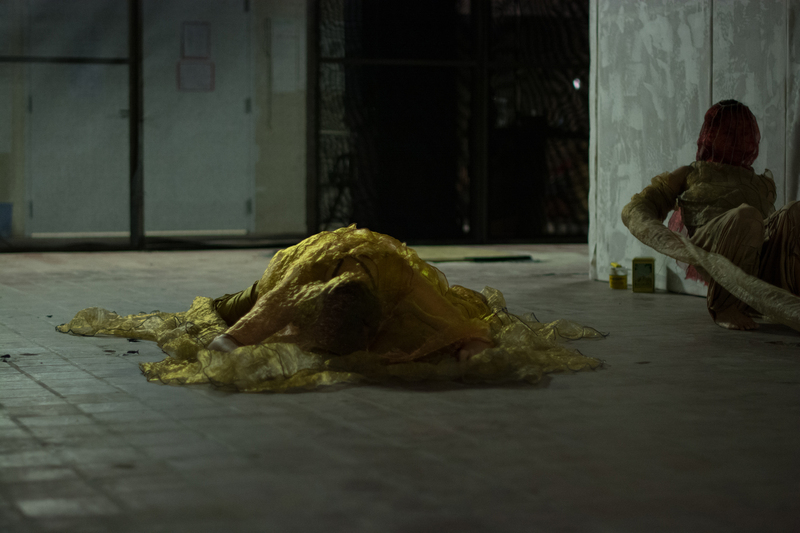 Dancers are scattered about writhing on the floor, covered in gauzy shrouds. We are guided through a catacombs and stopped at various vantage points, some of these niches were already part of the space, others are conceived by Meyer, Lydia Meyer, and Sam Link. The experience is not unlike a haunted mansion tour, or a murder mystery dinner, with a few totally unexpected surprises appealing to all the senses. Lights turn on and off as we move from space to space, greeted each time by dancers performing grotesque vignettes. Hooded dancers collide with one another and wriggle on the floor, they move slowly to and fro, forward and backward, sometimes leaving entrails of gauzy tulle in their wake. Eventually we realize just how big the cast is, as they spill out of the yurt one by one to join in a big, physical, dancey phrase. It’s the only Dance (capital D) part of the The Cronus Land, and frankly, its weakest spot. The people who best perform Jonathan Meyer and Julia Rae Antonick’s movement are Jonathan Meyer and Julia Rae Antonick. With a large, fresh cast of new dancers, mostly unfamiliar to Meyer’s aesthetic, this sweeping dance phrase suffered, perhaps with the exception of Antonick and Molly Ross, a seasoned performer and newcomer to Chicago. My hope is that this section will continue to gel throughout the run of 21 (21!) shows. As curious as The Cronus Land itself is the setting in which it is situated: a historic Hyde Park gem nestled on the lakefront at 55th. The majestic Shoreland Hotel underwent a gut renovation less than five years ago; like so many of our prized historic landmarks, the Shoreland fell into disrepair and has been re-purposed for upper-middle class lakeside luxury living, but for whatever reason, the ballroom remained untouched through the renovation. Meyer explained that the day after Khecari’s load-out, the dilapidated space will be gutted, with office spaces put in its place. 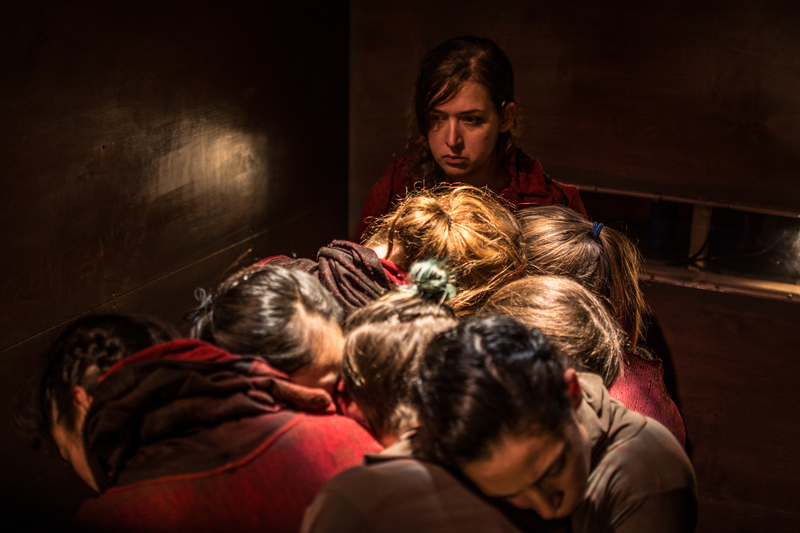 The Cronus Land is an expansion on Oubliette, last year’s critically-acclaimed dance performed in a tiny pit six feet below its audience. The second half is a re-imagination of Oubliette, expanding the cast to eight and cutting a few sections. I had flashes of memory in the second act from seeing Oubliette the first time, but much of my nostalgia was driven by a preference for the previous version. The Cronus Land was bigger, more magical, and theoretically better, but I’m not entirely certain that act one and act two are meant to be together. Plus there’s something to be said about remaining true to small packages and a tightly compacted idea (literally and figuratively). How do you change or evolve something that is pretty much perfect? Simple. You don’t. That being said, if the alternative is that Oubliette becomes a distant memory and eventually fades away entirely, like the Shoreland Ballroom converted into a sea of lifeless cubicles, I’ll take The Cronus Land any day. Khecari presents ‘The Cronus Land’ through November 13 at Shoreland Ballroom (5454 S. Shore Dr.). Performances are at 8:00 pm. Tickets are extremely limited, ranging in price from $10-250 online at khecari.ticketleap.com/cronus. The space is not ADA rated but all portions are accessible for people with disabilities.